A MOMENTOUS DECISION has just been made. For months we have faced the problem of getting TOMORROW'S WORLD to the many thousands of PLAIN TRUTH subscribers in Germany, France, Belgium, Holland, and Spanish-speaking countries. The superintendents of our printing plants in Pasadena and Radlett, England, have been working on our mechanical problems of synchronizing the various foreign language editions in the composing rooms, and on our giant full-color magazine presses. But our main problem was one of cost — fitting this large additional production and distribution operation into the budget. So I called our editors, printing plant managers, and others from England, Germany, and Texas (where the Spanish edition is edited) to Pasadena. Our editors and plant managers here at Headquarters, with our financial planners — some twenty executives — sat down with me in our board room. It was a knotty problem. It meant another giant undertaking, and it involved large outlays of money. It appeared that our budget could not absorb so great an additional outlay. Before this assembly of executives in God's Work, I began, after prayer, by stating the problem. A little over two years ago, we made a very important and far-reaching decision, changing the entire program of the Work. This great worldwide Work was started through me, with the help of my wife, almost 38 years ago in Eugene, Oregon. The radio broadcast, which later came to be The WORLD TOMORROW started the first Sunday in 1934. February 1, 1934, the first issue of The PLAIN TRUTH came out, a mimeographed "magazine," about 250 or 350 copies. Both the radio program and The PLAIN TRUTH were then completely Biblically oriented. This very fact virtually confined listening and reading audiences to what is often called "the religious audience." I estimated this as not more than 5% to 8% of the total listening and magazine-reading population. Yet there were reasons why the Work could not have been started any other way. As the years and decades passed by, the percentage of that portion of the whole population appeared to decrease. The world was drifting away from sound moral and religious interest. Education had become totally academic, concerned only with the mind. Gradually, in both the broadcasts and magazine articles, in order to get God's Message to the world — to get the world to LISTEN, or to read — we found it necessary to discuss more and more world conditions, social and family conditions and problems. And more and more, as prejudice increased against anything that sounded "religious," we had to speak to the world in the world's language, not in King James Bible language. A little over two years ago, we were faced with the problem that as a straight Biblical religious message, we had reached the saturation point — the point of "diminishing returns." It was becoming more and more difficult to obtain time on the better and most listened — to radio stations if the program contained any "religion." The same was true to a greater degree on T.V. Faced with this situation, we made a drastic change in the editorial policy of The PLAIN TRUTH It became entirely a secular-appearing magazine. I say secular-appearing because the word secular is sometimes used in the sense of meaning non-religious or even anti-religious. Although The PLAIN TRUTH is actually based on Biblical revelation, instruction and teaching, it gives this teaching in non-Biblical and non-religious terminology. As the Apostle Paul was all things to all men, so we speak to the world in the world's language, not in religious-sounding language. Thus we do proclaim God's way of life, though we do not call it by that name — in The PLAIN TRUTH. But this change in PLAIN TRUTH editorial policy made necessary the production of a NEW magazine of Biblical understanding. Thus TOMORROW'S WORLD was born. It became what The PLAIN TRUTH wed to be — a magazine of Biblical truth and understanding - making the truth of the Bible PLAIN! But we were unable, at the time, to have both The PLAIN TRUTH and TOMORROW'S WORLD published in the other four languages. Meanwhile, the German edition went wholly secular appearing, like the English edition. We were no longer making the Bible, as such, PLAIN and clear to our German readers — even though we were still giving them Biblical principles and teaching in non-Biblical language. The French edition became a sort of mixture between the two. I called this conference to go over all the facets of this problem so I could make the right decision. It became evident that it was incumbent on us to issue both magazines in all five languages — otherwise we were simply not carrying out our divinely called mission. That had to be the decision. And once I realized that, I said that we could rely on God to supply the need. To help, it was decided that for the first six months the foreign language editions of TOMORROW'S WORLD would contain only one signature of 16 pages plus cover — and with only the cover in color — the 16 pages in black and white only. And, further to help, we would at the same time reduce the English edition from three 16-page signatures to two — making it 32 pages plus cover — total 36 pages. 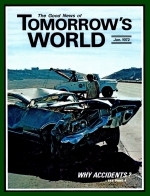 Therefore, starting with this issue — the January 1972 number — English edition of TOMORROW'S WORLD is reduced to the 36 pages. We are sorry we have to ask you, our readers, to sacrifice this one signature. BUT - we know that you'll be glad to help make possible TOMORROW'S WORLD in four other languages. Soon, I hope, we shall have both magazines issued in Italian and in Japanese, and later other languages. But it is another big milestone reached in the Work — another big leap ahead — that beginning 1972 we shall issue both The PLAIN TRUTH and TOMORROW'S WORLD in all five languages — reaching millions of additional readers in Germany, France, Belgium, Austria, Holland, Spain, Mexico and many other Spanish — speaking countries. And by the way, for the first time a Spanish radio station in Madrid has opened the door to broadcast The WORLD TOMORROW in the Spanish language.